In some cases, your library may not be able to fulfil an Inter-library Loan request. Where that request is received via email. 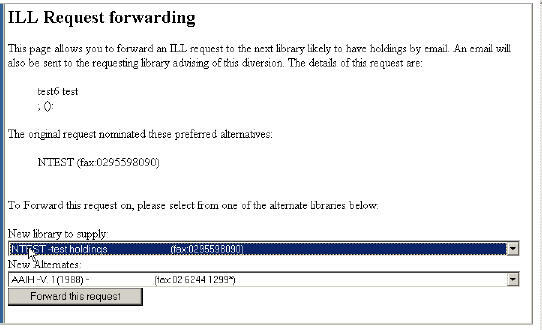 This FAQ guides you through the process of electronically forwarding your request to the next library with holdings. When you activate this link, you may be required to log into Interloans with your normal log-in. You will then be presented with the request forwarding dialogue shown below. Please follow the forwarding sequence requested by the requesting library where possible. The library specified in "New library to supply" will receive a forwarded email request and the requesting library will also recieve an email indicating that you have forwarded this request on.